Measure Volts, Ohms, Amps, RTD, Thermocouple, Strain Gage, Load Cell. This module does not contain an A/D converter, and therefore internally routes measured voltage to an i43x A/D module anywhere in card cage. At least one i43x must be installed in order to measure a voltage with this module. Excitation power (+3.3V ±0.2V, <220mA, 22mA per sensor max) is provided for sensors, along with other End User Power voltages. This 3.3V, which is referenced to instruNet Ground, is automatically readback by A/D when calculating sensor values. 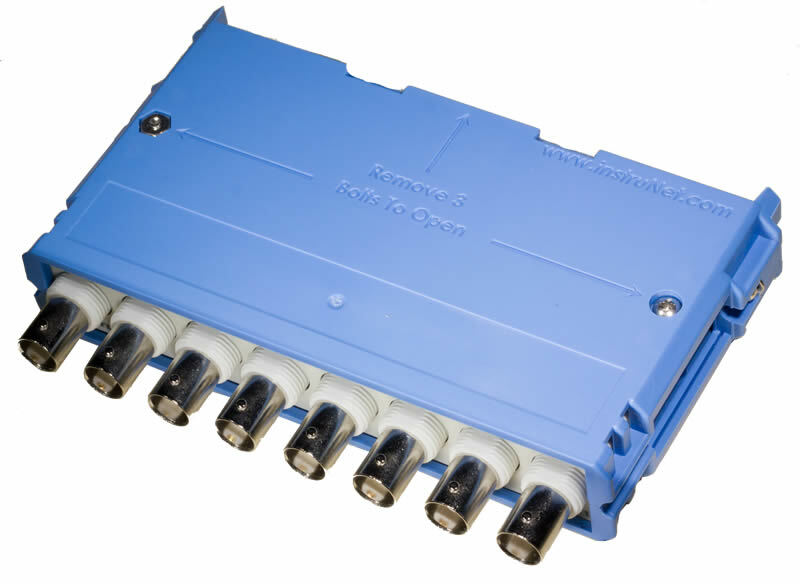 The 20mA sink digital I/O port consists of 4 individual TTL-compatible lines (Ch#25...#28), each of which can be configured as: digital input bit, digital output bit, control output, clock output43 . When configured as an input, a channel can be used to sense a digital high (2.1 to 30 Volts) or digital low (-10V to .65Volts). When configured as an output, a channel can be set high (e.g. >2V) or low (e.g. <0.8V). 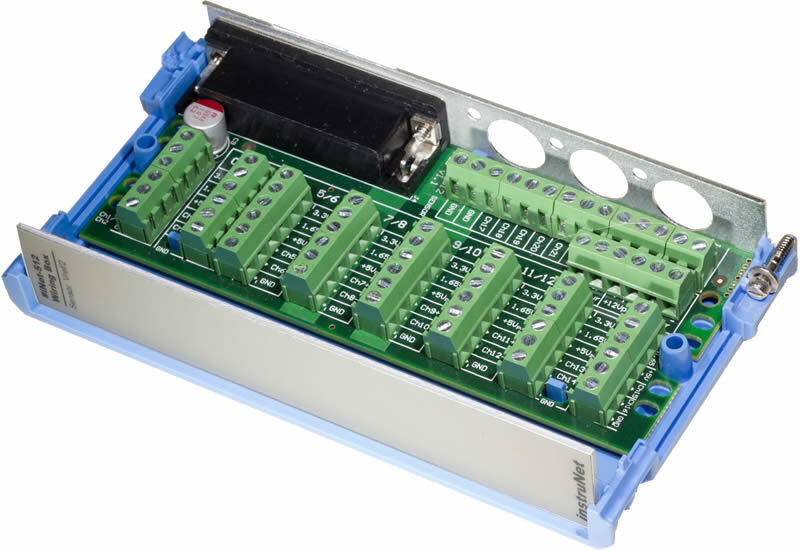 These I/O pins are short-circuit protected against high voltages up to 32.0V and down to -16.0V. Internal A/D (none) This module does not contain an A/D converter, and therefore internally routes measured voltage to an i43x A/D module anywhere in card cage. At least one i43x must be installed in order to measure a voltage with this module. Digital Filter LowPass, HighPass, BandPass, or BandStop Each channel provides optional digital IIR lowpass, highpass, bandpass and bandstop filters with independent software programmable cut-off frequency, minimum dB stopband attenuation, maximum dB passband attenuation, and filter type (e.g. Elliptic, Chebyshev B, Chebyshev S, and Butterworth). Number of poles/zeros (i.e. "filter order") is programmable between 2 and 3255 . Maximum Sample Rate17 166Ks/sec/aggregate Digitize70 at a maximum sample rate of 166K sample/sec for 1 channel on largest voltage input range. More channels at same voltage input range involves slower rates, e.g. 83Ks/sec per channel for 2 channels, 41Ks/sec/ch for 4 channels, and 20Ks/sec/ch for 8 channels. For a details on maximum sample rate and bandwidth with different voltage input ranges, sensor types, and a/d averaging61 ; see absolute accuracy specification tables below (e.g. Voltage Accuracy). Things that decrease High Speed I/O sample rate: longer computer to instruNet cable, i330 optical-isolator. Sample rate is set accurate to 50 ppm (e.g. user specifies 20000 s/sec yet system actually digitizes at 20001 s/sec). Minimum sample rate is 0.015 samples/sec/ch. Sensor Excitation Included Excitation power (+3.3V ±0.2V, <220mA, 22mA per sensor max) is provided for sensors, along with other End User Power voltages. This 3.3V, which is referenced to instruNet Ground, is automatically readback by A/D when calculating sensor values. Crosstalk < -80dB typ Crosstalk from one channel to another depends on sample rate and frequency of applied signal, and is typically < -80dB; i.e. -80dB = 20 * log (1 / 10000). For example, one can apply a 10Hz 10Vpp sinewave to Ch1 on the ±5Vrange, apply 0 Volts DC to Ch3 on the ±2.5Vrange, digitize both at the maximum sample rate, and see < 1mVpp sinewave on Ch3, in a typical case. The amplitude of this sinewave would decrease with slower sample rates, and increase with higher sinewave frequencies. Current Pump 60 pC max Internal multiplexors pump a small amount of current out voltage measurement pin and into the end user circuit when channels switch. This is normal for multiplexors (they all do this), and is automatically mitigated when doing sensor measurements by waiting for current to dissipate before taking the measurement. If you don't like multiplexors, or need fast sample rates with low level signals; please see i423 which routes inputs to instrumentation amplifiers instead of multiplexors. Input leakage current 2.8 nA max at 37°C This is a small current that flows out the voltage input pin and into the end user circuit. It has little effect unless measuring small voltages (e.g. expecting accuracy better than ±100uV) with a high source impedance (e.g. > 2K Ω). Maximum leakage is 2.8 nA at 37°C, and 1.4 nA at 25°C. Common Mode Rejection Ratio ≥ 74dB CMRR is the amount of rejection of a common signal that is present on both inputs of a differential measurement. Theoretically, it should not be measured because the differential measurement looks at the voltage between two pins; however small internal imbalances cause a small error, which is specified here with a DC to 60Hz common mode signal. Calibration Software Control instruNet hardware is calibrated66 when the system is reset (i.e. press RESET button, load .prf configuration file, or start instruNet software), and when the system is software calibrated (i.e. press CALIBRATE button, issue software calibrate command, or set up software to calibrate every X minutes59 ). 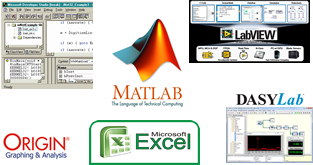 Software Interface Windows Compatible instruNet Scalar I/O and High Speed I/O60 interface subroutines execute on Windows Computer via instruNet World, Visual Basic, C, Labview, or DasyLab software. Scalar I/O reads or writes 1 value at a time; whereas High Speed I/O reads or writes multiple values (i.e. a waveform) at a fixed rate (i.e. sample rate). Maximum Waveform Size Limited by Computer Continuously digitize into Windows computer RAM or into file on Windows computer hard disk62 . Maximum file size is limited by available space on hard disk. Data consumes 4 bytes per point. Description 4 Bidirectional Digital I/O The 20mA sink digital I/O port consists of 4 individual TTL-compatible lines (Ch#25...#28), each of which can be configured as: digital input bit, digital output bit, control output, clock output. When configured as an input, a channel can be used to sense a digital high (2.1 to 30 Volts) or digital low (-10V to .65Volts). When configured as an output, a channel can be set high (e.g. >2V) or low (e.g. <0.8V). These I/O pins are short-circuit protected against high voltages up to 32.0V and down to -16.0V. Function Multiple Options Software programmed to one of: digital input bit, digital output bit, control output, clock output. Clock output options are: 24MHz, 12MHz24 , 6MHz, 1.5MHz, 1MHz, 375KHz, 100KHz, 94KHz, 23KHz, 10KHz, 5.9KHz, 1.5KHz, 1KHz, 366Hz, 100Hz, 92Hz, 23Hz, 10Hz, 5.7Hz, 1.4Hz, 1Hz, 0.358Hz, 0.0894Hz. Control output options are: pulse low when rd/wr to Uio 25..28 port, pulse low when read from Uio 25..28 port, pulse low when in software reset or power is off. Maximum Sample Rate17 166Ks/sec/aggregate Input70 digital data at a maximum sample rate of 166K sample/sec for 1 channel. More channels involve slower rates, e.g. 83Ks/sec per channel for 2 channels, 41Ks/sec/ch for 4 channels, and 20Ks/sec/ch for 8 channels. Things that decrease High Speed I/O sample rate: longer computer to instruNet cable, i330 optical-isolator. Sample rate is set accurate to 50 ppm (e.g. user specifies 20000 s/sec yet system actually digitizes at 20001 s/sec). Minimum sample rate is 0.015 samples/sec/ch. "1" Input Voltage +2.1 to +30V Applying +2.1 to +30V is read as logic 1 when I/O pin is configured as input. If left unconnected this pin floats to 4.5V. Maximum Waveform Size Limited by Computer Continuously input into Windows computer RAM or into file on Windows computer hard disk62 . Maximum file size is limited by available space on hard disk. Data consumes 4 bytes per point. #2 Ch2 Vin- SE Voltage Input 2 " " "
#3 Ch3 Vin+ SE/DI Voltage Input 3, 4 " " "
#4 Ch4 Vin- SE Voltage Input 4 " " "
#5 Ch5 Vin+ SE/DI Voltage Input 5, 6 " " "
#6 Ch6 Vin- SE Voltage Input 6 " " "
#7 Ch7 Vin+ SE/DI Voltage Input 7, 8 " " "
#8 Ch8 Vin- SE Voltage Input 8 " " "
#9 Ch9 Vin+ SE/DI Voltage Input 9, 10 " " "
#10 Ch10 Vin- SE Voltage Input 10 " " "
#11 Ch11 Vin+ SE/DI Voltage Input 11, 12 " " "
#12 Ch12 Vin- SE Voltage Input 12 " " "
#13 Ch13 Vin+ SE/DI Voltage Input 13, 14 " " "
#14 Ch14 Vin- SE Voltage Input 14 " " "
#15 Ch15 Vin+ SE/DI Voltage Input 15, 16 " " "
#16 Ch16 Vin- SE Voltage Input 16 " " "
#17 Ch17 Vin+ SE/DI Voltage Input 17, 18 " " "
#18 Ch18 Vin- SE Voltage Input 18 " " "
#19 Ch19 Vin+ SE/DI Voltage Input 19, 20 " " "
#20 Ch20 Vin- SE Voltage Input 20 " " "
#26 Ch26 Uio " 26 " " "
#27 Ch27 Uio " 27 " " "
#28 Ch28 Uio " 28 " " "
#2 Ch2 Vin- SE/DI- Voltage In "
#3 Ch3 Vin+ SE/DI+ Voltage In "
#4 Ch4 Vin- SE/DI- Voltage In "
#5 Ch5 Vin+ SE/DI+ Voltage In "
#6 Ch6 Vin- SE/DI- Voltage In "
#7 Ch7 Vin+ SE/DI+ Voltage In "
#8 Ch8 Vin- SE/DI- Voltage In "
#9 Ch9 Vin+ SE/DI+ Voltage In "
#10 Ch10 Vin- SE/DI- Voltage In "
#11 Ch11 Vin+ SE/DI+ Voltage In "
#12 Ch12 Vin- SE/DI- Voltage In "
#13 Ch13 Vin+ SE/DI+ Voltage In "
#14 Ch14 Vin- SE/DI- Voltage In "
#15 Ch15 Vin+ SE/DI+ Voltage In "
#16 Ch16 Vin- SE/DI- Voltage In "
#17 Ch17 Vin+ SE/DI+ Voltage In "
#18 Ch18 Vin- SE/DI- Voltage In "
#19 Ch19 Vin+ SE/DI+ Voltage In "
#20 Ch20 Vin- SE/DI- Voltage In "
#26 Ch26 Uio " "
#27 Ch27 Uio " "
#28 Ch28 Uio " "
Description External Power +3.3V, +5V, +12V, and -12V power (< 300mA) is available to the end user at several Hd44 Connector217 pins. +12Vdc Requirement +12V ±0.8V, ~50mA "
-12Vdc Requirement -12V ±0.8V, ~25mA "
The iNet-420 module supports quantity 10 Voltage devices wired Differential or 20 wired Single-Ended. Absolute Accuracy is specified as a percentage of measured value PLUS a fixed offset. It is the sum of the following errors components, each in their worst case (we are conservative): Intergal Nonlinearity (INL), Differential Nonlinearity (DNL), system noise (ground input, digitize, and see noise), gain/offset temperature drift, gain/offset time stability drift, gain/offset initial offset error, 2.8nA max leakage current (at 37°C) times 50Ω user source impedance error, and voltage reference temperature/time drift 66 . Noise offset error is modeled as 3 times the Noise RMS value (99.7%). Absolute Accuracy is the same as Maximum Worst Case error. For Typical error, divide maximum by 2. Absolute accuracy is shown with both a gain and offset component, where the offset error is independent of the input voltage, and the gain error is porportional to the the input. For example, if one measures 2Volts and the absolute accuracy specification is ±(1% + 3mV), then one could expect ±(1% * 2V + 3mV) = ±23mV accuracy. These specifications assume the external end user source resistance is <50 Ω (op amp source); and the external end user source capacitance to GND is < 1000 pF. Calibration: These specifications assume 1 year since Factory Calibration, instruNet hardware ambient temperature is between 13 and 33 °C, and instruNet hardware temperature changed 1°C since its last self-calibration 59 . The iNet-420 module supports quantity 10 Thermocouple devices wired Differential (not SE). Absolute Accuracy is specified as a percentage of measured value PLUS a fixed offset. It is the sum of the following errors components, each in their worst case (we are conservative): voltage measurement errors as described above, cold junction compensation (supplied automatically by instrunet) error, polynomial linearization error, 0.2°C instrunet screw terminal temperature change since last autocalibration, multiplexor current pump error. Absolute Accuracy does Not include errors from the actual Thermocouple device. Absolute Accuracy is the same as Maximum Worst Case error. For Typical error, divide maximum by 2. These specifications assume signal averaging per point is 0.1mSec Integ for all rows3 . Measurement of thermocouples Requires that an i51x Wiring Box be attached to the i4xx Module, and that the thermocouple leads are attached directly to the i51x screw terminals (for automatic Cold Junction Compensation). The measured thermocouple temperature is a function of the instruNet hardware screw terminal temperature and the voltage measured across the thermocouple. Therefore, an additional temperature measurement error of 1°C occurs for each 1°C change of the instruNet screw terminal temperature since the last instruNet auto-calibration (where it measures screw terminal temperature) 59 . For example, if the instruNet hardware auto-calibrates when it's screw terminals are at 23°C, and they then heat up 3°C before another auto-calibration, then all thermcouple measurements will return a temperature that is 3°C higher than expected. One can program the instruNet to auto-calibrate once every 1 to 1000 minutes. These specifications assume the thermocouple device is grounded at the instruNet (e.g. the end user connects an external wire between the i51x Vin Minus (Vin-) and GND screw terminals). Calibration: These specifications assume 1 year since Factory Calibration, instruNet hardware ambient temperature is between 13 and 33 °C 59 . The iNet-420 module supports quantity 10 Thermistor devices wired Differential or 20 wired Single-Ended. Absolute Accuracy is specified as a percentage of measured value PLUS a fixed offset. It is the sum of the following errors components, each in their worst case (we are conservative): voltage measurement errors as described above, readback of excitation voltage error, sensor self heating error, external shunt resistor self heating error, external shunt resistor initial accuracy error, instruNet input impedance variation error, 2.8nA max leakage current (at 37°C) times user source impedance error, polynomial linearization error, multiplexor current pump error. Absolute Accuracy does Not include errors from the actual Thermistor device. Absolute Accuracy is the same as Maximum Worst Case error. For Typical error, divide maximum by 2.
instruNet connects directly to all types of Thermistor's. The end user must supply one external shunt resistor per channel (i.e. this resistor is not included with i4xx or i51x products). The end user must supply Steinhart a/b/c coefficients, unless working with YSI/Omega 4xx or 4xxxx series thermistors 23 . These specifications assume that less than 1000 pF of external capacitance is between the end user source and GND. instruNet provides a fixed 3.3V excitation voltage which is accurately readback in order to calculate °C. These specifications assume an i51x Wiring Box is attached to the i4xx Module, and that the device leads are attached to the i51x screw terminals (for accurate readback of 3.3Vref). The i51x can be attached directly to the i4xx front panel; or a cable can be placed between the i4xx and i51x wiring box (e.g. ≤ 5meters, 44 wire, point-to-point) without degradation of accuracy. 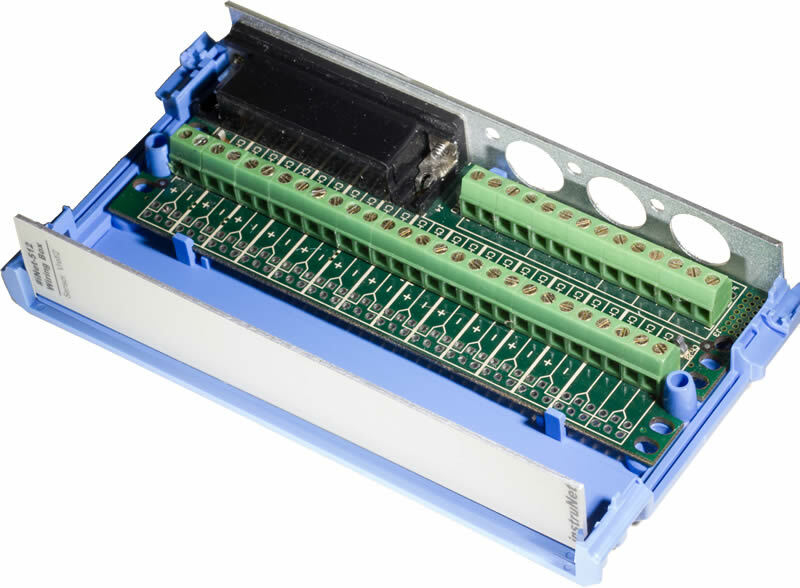 The iNet-420 module supports quantity 10 RTD devices wired Differential or 20 wired Single-Ended. Absolute Accuracy is specified as a percentage of measured value PLUS a fixed offset. It is the sum of the following errors components, each in their worst case (we are conservative): voltage measurement errors as described above, readback of excitation voltage error, sensor self heating error, external shunt resistor self heating error, external shunt resistor initial accuracy error, instruNet input impedance variation error, 2.8nA max leakage current (at 37°C) times user source impedance error, multiplexor current pump error. Absolute Accuracy does Not include errors from the actual RTD device. Absolute Accuracy is the same as Maximum Worst Case error. For Typical error, divide maximum by 2.
instruNet connects directly to all types of RTD's. The iNet-420 module supports quantity 10 Load Cell devices wired Differential (not SE). Absolute Accuracy is specified as a percentage of measured value PLUS a fixed offset. It is the sum of the following errors components, each in their worst case (we are conservative): voltage measurement errors as described above, readback of excitation voltage error, 2.8nA max leakage current (at 37°C) times user source impedance error, multiplexor current pump error. Absolute Accuracy does Not include errors from the actual Load Cell device. Absolute Accuracy is the same as Maximum Worst Case error. For Typical error, divide maximum by 2.
instruNet connects directly to all types of Load Cell's. These specifications assume the device has been calibrated at the 0 point. This "balancing" involves appling 0 force and then telling instruNet to "balance bridges" via a software command. Subsequently, instruNet automatically subtracts this voltage from future measurements. 120Ω devices are typically not used due to excess heating at the device (3.3V / 120Ω = 27mA, 90 mWatts). ≥ 350Ω devices are preferred (3.3V / 350Ω = 9mA, 31 mWatts). instruNet provides a fixed 3.3V excitation voltage which is accurately readback in order to calculate Kg. The iNet-420 module supports quantity 10 Strain Gage devices wired Differential (not SE). Absolute Accuracy is specified as a percentage of measured value PLUS a fixed offset. It is the sum of the following errors components, each in their worst case (we are conservative): voltage measurement errors as described above, readback of excitation voltage error, external shunt resistor self heating error, 2.8nA max leakage current (at 37°C) times user source impedance error, multiplexor current pump error. Absolute Accuracy does Not include errors from the actual Strain Gage device. Absolute Accuracy is the same as Maximum Worst Case error. For Typical error, divide maximum by 2.
instruNet connects directly to all types of Strain Gage's. The end user must supply 2 external shunt resistors if working with a half bridge and 3 external resistors if working with a quarter bridge (i.e. 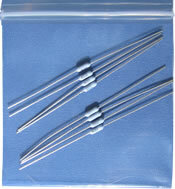 these resistors are not included with i4xx or products). instruNet provides a fixed 3.3V excitation voltage which is accurately readback in order to calculate μS. The iNet-420 module supports quantity 10 Potentiometer devices wired Differential (not SE). Absolute Accuracy is specified as a percentage of measured value PLUS a fixed offset. It is the sum of the following errors components, each in their worst case (we are conservative): voltage measurement errors as described above, readback of excitation voltage error, instruNet input impedance variation error, 2.8nA max leakage current (at 37°C) times user source impedance error, multiplexor current pump error. Absolute Accuracy does Not include errors from the actual Potentiometer device. Absolute Accuracy is the same as Maximum Worst Case error. For Typical error, divide maximum by 2.
instruNet connects directly to all types of Potentiometer's. instruNet provides a fixed 3.3V excitation voltage which is accurately readback in order to calculate Eu. The iNet-420 module supports quantity 10 Current devices wired Differential or 20 wired Single-Ended. Absolute Accuracy is specified as a percentage of measured value PLUS a fixed offset. It is the sum of the following errors components, each in their worst case (we are conservative): voltage measurement errors as described above, readback of excitation voltage error, external shunt resistor self heating error, external shunt resistor initial accuracy error, instruNet input impedance variation error, 2.8nA max leakage current (at 37°C) times user source impedance error, multiplexor current pump error. Absolute Accuracy is the same as Maximum Worst Case error. For Typical error, divide maximum by 2.
instruNet hardware measures the voltage across an external current shunt resistor. Both sides of this resistor must be within ±5 Volts of instruNet GND at all times. The iNet-420 module supports quantity 10 Resistance devices wired Differential or 20 wired Single-Ended. instruNet provides a fixed 3.3V excitation voltage which is accurately readback in order to calculate Ω.